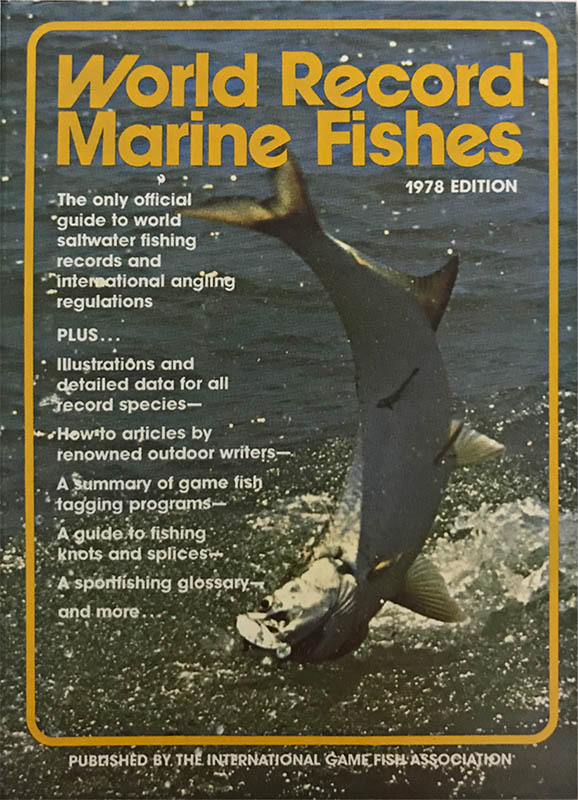 In April 1978, IGFA members were stunned when they pulled their annual World Record Marine Fishes book from the mailbox. Gone was the undersized format and dry recitation of facts and figures. The new WRMF was a 240-page perfect-bound goliath, chockablock with color photographs, advertisements, and editorials written by some of the leading outdoor writers of the day. Each of the now 64 record species had its own page with a detailed line drawing and data on distribution, identifying features, behavior patterns, and more. The cover photo was a spectacular shot by fishing celebrity Stu Apte of a somersaulting tarpon, a sight to thrill even the most unflappable anglers and a distinctive symbol of the frenetic action underway at IGFA headquarters in Ft. Lauderdale. Elwood Harry’s day had dawned, and he was wasting no time.